The original founding Bohemian community theater troupe of Carmel. Established in 1909 by the San Francisco Bohemian writers, poets and artists of the turn of the century - the likes of Jack London, Mary Austin, George & Carrie Sterling and Carmel's Poet - Robinson Jeffers. 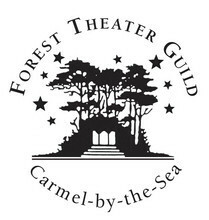 The founding Director of the FTG, Herbert Heron and his Polish Princess wife, Opal formed the first community theater of this artist community in the nature forested amphitheater located at Santa Rita & Moutain View in downtown Carmel-by-the-Sea. 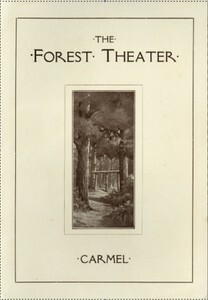 A specially adapted version of the Shakespeare tragedy "HAMLET" was performed in honor of our 1923 Forest Theater historic production, starring John Barrymore III, the grandson of the great John Barrymore who first performed this play on the London stage in the 1920's. This production featured four great actors of our local stage. Cast: John Barrymore III as Hamlet, Nick Hovick as Claudius, Larry Welch as Polonius, and directed by John Barrymore III. The production ran June 27th - July 23rd, 2013. OUR PLAYS AND TICKETS Performances for our plays are Friday and Saturday 8pm, Saturday & Sunday Matinee 2pm Tickets for our live performances are $25 each Adults & $20 Seniors, Teacher and Military $20, $10 children (4 and under free) and Sunday Matinee are same pricing.Special events will be announced in the newspaper and on our website as they are confirmed.OUR CONCESSIONS SERVE GREAT GOURMET FOODS, FRESH LOCAL CUISINE AND HEALTHY SNACKS, BAKERY FRESH EVERY DAY, GOOD DRINKS, TREATS, CANDY, COOKIES, BROWNIES and Assorted specialty gourmet "Local" hot foods. You may bring your own picnic and wine to the theater and enjoy the surrounding forest. Films in the Forest returns next summer on Tuesday, Wed & Thursday nights. The schedule is posted on our website in Spring of 2015 www.foresttheaterguild.org and tickets can be purchased at the door the night of the film screening. Tickets are $7.00 adults or children (DOGS ARE ALLOWED AT FILMS, ON LEASE AND CONTROLLED) Films in the Forest sponsor opportunities are available for the 2015 Season and can be a great way to celebrate with your local business or school and host a private reception prior to our films. Please call our office for more info at 831-419-0917.FILMS IN THE FOREST TICKETS ARE AVAILABLE AT THE DOOR $7.00 PER ADULT OR CHILD. FOOD CONCESSIONS OPEN DURING THE SHOWS AND DOGS AND CHILDREN ARE WELCOME. BRING A BLANKET, A PICNIC, AND GET READY FOR A NIGHT UNDER THE STARS.We offer special sponsor opportunities this year and you can contact our offices 831-626-1681 SUMMER CLASSES & WORKSHOPS - MAY - JULY 2015. 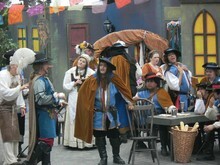 2012 Production of "Cyrano de Bergerac"